A friend and I had the pleasure of staying here last month. It is located on a side street that was difficult to locate at first, but it is centrally located in Old Havana. 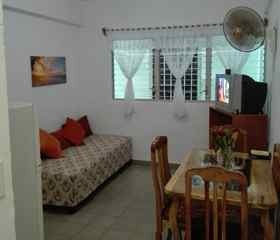 It was super clean and the kitchen had dishes and even a microwave and full fridge which was very nice. The host Tatiana is an excellent cook and took very good care of us. Another plus is the aircon and the fans that are quiet and cooling. We didnt mind being in an inside apartment, as it offered us the welcome peace and quiet from the busy city after a long day and night of exploring. Will be back. Exelente atención, muy bueno y completo el desayuno brindado por Pedro. Es una casa que se puede recomendar y no quedar mal.